(CNN) -- President Obama marked another 100-day anniversary Wednesday -- this time the anniversary of the enactment of his $787 billion economic stimulus package. President Obama said Wednesday that the country is already seeing results from his economic stimulus plan. Addressing a crowd of military servicemen and women at Nevada's sprawling Nellis Air Force Base, Obama said that "we are already seeing results" from the federal government's economic boost. "But this is just the beginning," he said. 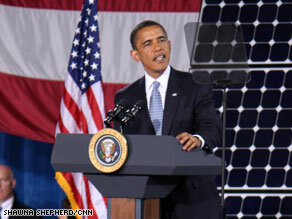 Obama made his remarks after touring the base's "photovoltaic array" -- 72,000 solar panels that generate more than 30 million kilowatt-hours of electricity every year, according to the White House. The panels supply roughly 25 percent of the power used at the base, which houses and employs 12,000 people. The base's solar power system is an example of "the kind of foundation we're trying to build all across America," Obama said. The system, covering 140 acres, is the largest single solar energy installation of its kind in the Western Hemisphere, he noted.